Study finds that solar often adds $15,000 to home value. A recent article by the Department of Energy references two recent studies, including this report by Lawrence Berkeley National Laboratory (LBNL), showed that homeowners across the country have been willing to pay a premium for a solar home that reflects the value of the solar system, which was about $15,000 for a home with an average-sized, resident-owned solar array. Although market factors like electricity rate and system price may impact the size of the premium, solar (photovoltaic, or PV) homes can be expected to sell for more than homes without PV. Pick My Solar specializes in solar panel cost comparison. Homeowners are guided through their solar options making solar an easy option. And future home buyers can begin working with Pick My Solar to learn about the potential solar options of homes that they are considering. And once they've purchased their new home, they can beging enjoying the savings right away with a new solar system installation. 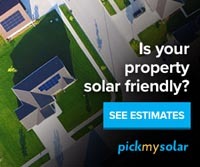 Visit Pick My Solar to see your solar options. *Pick My Solar is a partner of Realty Sage and our link is a referral. 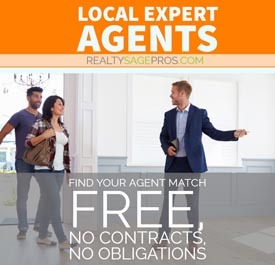 Meaning at no cost to you, if you click through and make a purchase Realty Sage will earn a commission. The Wattage, Capacity and Power Output of a Solar Panel System, What does it all mean and why does it matter? Figuring out your best options for solar on your home can be daunting. This excellent article by energysage.com gives you great information to start off the converstion with your solar installer. "For example, if two solar panels both have 15 percent efficiency ratings, but one has a power output rating of 250 watts and the other is rated at 300 watts, it means that the 300-watt panel is about 20 percent physically larger than the 250-watt panel. That’s why EnergySage and other industry experts view panel efficiency as being a more indicative criterion of solar panel performance strength than solar capacity alone."